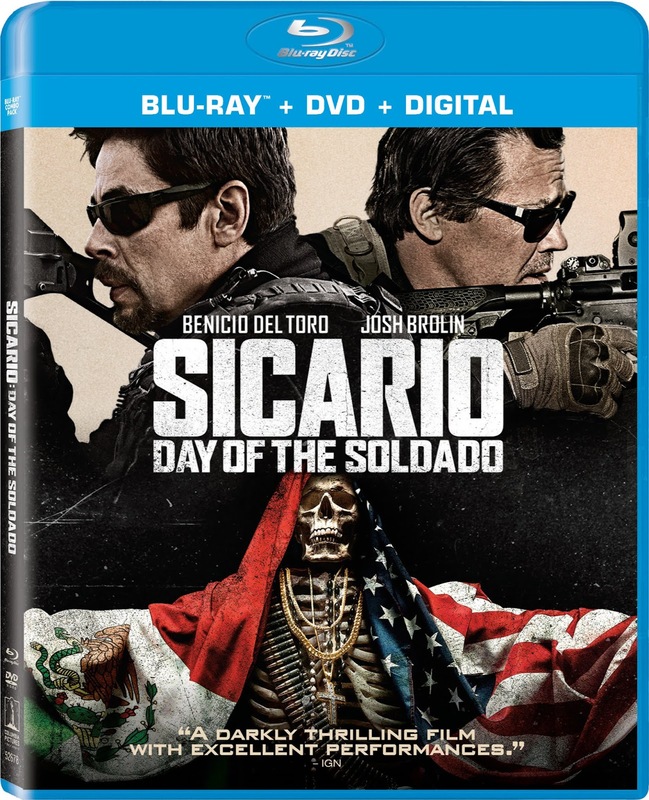 "Sicario: Day of the Soldado," the sequel to the incredible "Sicario," comes to blu-ray, DVD and digital. To enter you must be subscribed to my YouTube channel: Thisfunktional and follow instagram.com/Thisfunktional and email me your full name and mailing address with the subject line #ThisfunktionalContest #SicarioDayOfTheSoldado to Thisfunktional@Gmail.com. Disclaimer: Winners will be chosen randomly. Contest runs to October 8. 24, 2018 11:59 p.m. PST. No purchase necessary. Prize provided by MPRM Communications. Only open to the U.S., no PO Boxes or international addresses. Only one entry per household. Entries on behalf of another person will not be accepted and joint submissions are not allowed. We will not accept entries of contestants who have claimed a prize in the last 6 months. Experience the high octane action of one of the year’s most engrossing thrillers "SICARIO: DAY OF THE SOLDADO," as it debuted on digital and redeemable via the Movies Anywhere App, on 4K Ultra HD™/Blu-ray™, Blu-ray and DVD now from Sony Pictures Home Entertainment. Delving into the ruthless underworld of the war on drugs, Academy Award® winner Benicio Del Toro (Best Supporting Actor, Traffic, 2001) and Academy Award® nominee Josh Brolin (Best Supporting Actor, Milk, 2009) give explosive performances as they reprise their characters from Sicario to battle cartels across the border. Directed by Stefano Sollima (“Gomorrah”) and written by Academy Award® nominee Taylor Sheridan (Best Original Screenplay, Hell or High Water, 2016; Sicario), this dark and intense chapter also stars Isabela Moner (Transformers: The Last Knight), Jeffrey Donovan (TV’s “Fargo”), Elijah Rodriguez (Book of Life) and Academy Award® nominee Catherine Keener (Best Supporting Actress, Capote, 2006; Best Supporting Actress, Being John Malkovich, 2000). "SICARIO: DAY OF THE SOLDADO" Blu-ray, DVD, and Digital bonus features included three behind-the-scenes featurettes. “The Assassin and the Soldier: The Cast and Characters” has Del Toro and Brolin leading the conversation about how their characters Matt and Alejandro have evolved in this film, and takes a look at the strong supporting cast. Based on characters created by Sheridan, "SICARIO: DAY OF THE SOLDADO" was executive produced by Ellen H. Schwartz, Richard Middleton and Erica Lee. The film was produced by Basil Iwanyk, Edward L. McDonnell, Molly Smith, Thad Luckinbill and Trent Luckinbill. In "SICARIO: DAY OF THE SOLDADO," the series begins a new chapter. In the drug war, there are no rules – and as the cartels have begun trafficking terrorists across the US border, federal agent Matt Graver (Josh Brolin) calls on the mysterious Alejandro (Benicio Del Toro), whose family was murdered by a cartel kingpin, to escalate the war in nefarious ways. Alejandro kidnaps the kingpin’s daughter to inflame the conflict – but when the girl is seen as collateral damage, her fate will come between the two men as they question everything they are fighting for. "SICARIO: DAY OF THE SOLDADO" has a run time of approximately 123 minutes and is rated R for strong violence, bloody images, and language.